Sophie-Louise Dann has recently been seen in London in Ivor Novello’s “Gay’s the Word” at Jermyn St and has just finished a run at the Théâtre du Châtelet in Paris of Stephen Sondheim’s “Sunday in the Park with George”. 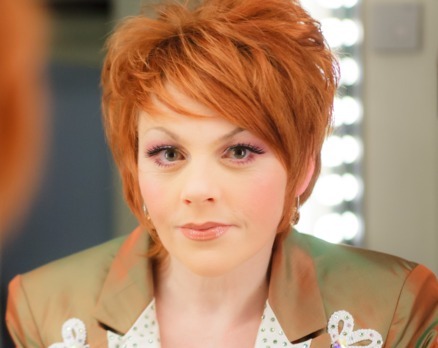 She is well known in the West End for her roles in Lend Me a Tenor (which garnered her an Olivier Award nomination) and Forbidden Broadway!, and also for her work in light opera, most particularly with the D’Oyly Carte. While she has previously performed From Classic… to Coward… to Current in New York and Los Angeles, this run at The Crazy Coqs is the first time London audiences have had a chance to see the show. Starting with a foodie theme, her opening two songs, Stephen Schwartz’s ‘It’s An Art’ (about a bad waitress) and Cole Porter’s ‘Tale of the Oyster’, reveal that Dann not only has a humorous, quirky quality to her personality, but her impressive vocal range and agility. She moves easily through all registers and styles from belt to opera in one song to express the narrative paths she wants to follow. There is more comedic material to come, including a lovely original number, Jason Carr’s ‘Three Whole Days’, and a sprinkling of Sondheim material. During a few moments respite from the laughs, there are renditions of ‘A Nightingale Sang in Berkeley Square’, a tender Noel Coward medley ‘Why Does Love Get in the Way?’/‘If Love Were All’, and a well-sung version of Kurt Weill and Ogden Nash’s ‘I’m A Stranger Here Myself’. The second half has a different feel to it, opening somewhat surprisingly with the folksy classic ‘The Singer’ and a standout number, ‘Back to Before’ from Ragtime. In some ways deliberately less reliant on comic work, this is the stronger set, less repetitive in terms of mood and enabling us to see the range this artist is capable of. Along with traditional cabaret fare, such as a beautifully soulful ‘Moon River’, this better balanced half still includes funny numbers, not least Lee and Weston’s ‘The Gypsy Warned Me’, boosted by some slick lighting adding to the comic effect (credit to resident technician Justin Smith). Dann’s pianist James Church plays with skill and sensitivity. There were a few first night hiccups when performer and musician were a little out of sync with one another, but they in no way marred one’s enjoyment of this delightful artist. This entry was posted in Cabaret Reviews and tagged cabaret, cabaret reviews London, Crazy Coqs, fiona jane weston, James Church, Jason Carr, London cabaret, sohie Louise Dann. Bookmark the permalink.